The Luxury Education Foundation is delighted to host a series of evening conversations with luxury experts at Columbia Business School, featuring guest speakers from the industry and other relevant industries. 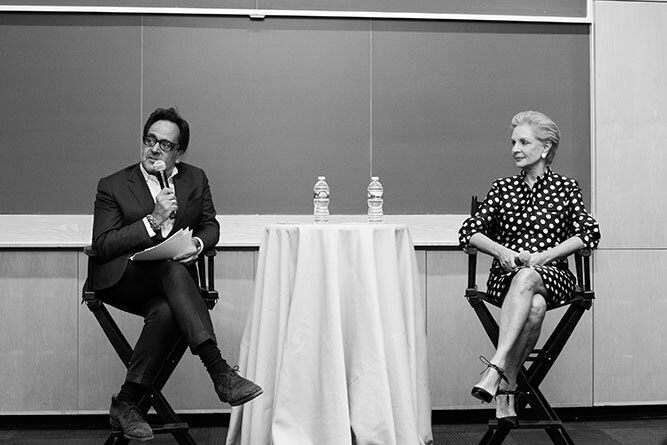 LEF presented the third in the series, “Conversations on Luxury” featuring a special conversation between the fashion and lifestyle visionary, Carolina Herrera and Richard David Story, Editor-in-Chief of Departures. Establishing a globally recognized style, Carolina Herrera has resided at the helm of her eponymous label for over three decades proving with each new season that effortless elegance paired with modern refinement is always relevant. With the encouragement and endorsement of legendary Vogue editor Diana Vreeland, Carolina Herrera presented her first collection of women’s ready-to-wear at New York’s Metropolitan Club in 1981. The collection was hauled as a success and embraced by luxury retailers and fashion press alike. From there, her fashion house was born with the Carolina Herrera New York label! Over the years, the Carolina Herrera brand has successfully expanded into several additional product categories such as Bridal, Fragrance, and Eyewear, each of which embody femininity, a touch of romance and exceptional craftsmanship known to the atelier. As a continuation of the runway collection, CH Carolina Herrera was introduced in 2001. A complement to ready-to-wear, the lifestyle collection is created in the spirit of Carolina Herrera’s design philosophy, including apparel and accessories for men, women and children. With over 125 retail locations in 36 countries and 223 shop in shops, the CH Carolina Herrera boutiques feature signature design components reflecting warmth, modernity and the effortlessly elegant environment known to Carolina Herrera’s surroundings. With both global recognition and praise, Carolina Herrera has been hailed as “Fashion’s First Lady.” She was named the Council of Fashion Designers of America Womenswear “Designer of the Year” in 2004 and honored with the Geoffrey Beene Lifetime Achievement Award in 2008. Acting as a mentor, critic and inspiration to graduating design students throughout her career, Carolina Herrera received the honorary Doctorate of Fine Arts from the Fashion Institute of Technology in 2012. In addition, she was awarded the 2012 Fashion Group International Superstar Award. In 2013, she was presented with the “Nat King Cole Award” for her charitable works and contributions to the EIF Women’s Cancer Research Fund. The Couture Council of The Museum at the Fashion Institute awarded Carolina Herrera with their 2014 Artistry of Fashion honor for her exquisite sense of style and her commitment to design excellence. Most recently, the designer received the 2015 “Who’s On Next Fashion Icon Award,” which was presented by past honoree and close friend Mario Testino and celebrates Carolina Herrera’s contribution to young designers and immense influence in the fashion industry. Richard David Story is Editor in Chief of DEPARTURES, the ultimate lifestyle magazine published exclusively for American Express Platinum Card and Centurion Members. DEPARTURES reaches affluent individuals around the globe with 52 editions in over 80 countries. He also oversees CENTURION, a bi-annual publication created exclusively for Centurion Members. Richard previously worked in an editorial role with Travel + Leisure. Before joining American Express Publishing in June 2000, he was features editor of Vogue, senior editor of InStyle, and assistant managing editor at New York. He has additionally held editorial positions at Esquire, USA Today, and Reader’s Digest. American Express Publishing was acquired by Time Inc. in 2013.